My teacher Sheng Yen painting calligraphy, in New York. It says bread, lettuce... I think it's a grocery list. 'nuther gung-an, perhaps. A vegetarian one, at that. "No ani-mules were harmed in the making of this calligraphy". Last edited by desert_woodworker on Sun May 27, 2018 8:28 pm, edited 1 time in total. Artist -- and U.S.A. NASA Apollo 12 Astronaut -- Alan Bean, has passed away, at age 82. I have one of his paintings, "Neil Goes Beyond the Boulders" (2012), a theme corresponding to the first Apollo landing, where Neil Armstrong landed the LEM, "Eagle" of Apollo 11, with 30 seconds of fuel remaining, after unexpectedly having to steer clear of a boulder-field full of big rocks which were not anticipated at the intended landing zone, saving himself and Buzz Aldrin. The Lunar Orbiter spacecraft images which surveyed the landing site a few years earlier had spatial resolution of about ten meters, from lunar orbit: the boulders were roughly ...ten meters in size. Cautionary tale!! p.s. R.I.P., Alan Bean. Godspeed, on the new leg of the journey, Old Man. Send some paintings from your new perch? Pls.? I see the likeness, Fuki, but I'm puzzled how you knew me at all back then. (BTW, and I think you may mean "younger" rather than "older" ? ). Last edited by desert_woodworker on Wed Jun 13, 2018 4:41 pm, edited 2 times in total. Here's an ink drawing by Bill Mauldin, made on-site during World War II, in Italy. I meant to say older Joe, as in Dylan's "my back pages"
I think I have a Zimbabwean dollar stored somewhere from an old friend no longer with us in form, he worked for the red cross and was a physician in third world countries, named Frans. I still have his checkbook, just name your price. p.s. cat seems "the picture" of health, and spirit. Celebrate! She is me and I am her, Joe. None of "us" own each other, if she wants to live with you she has my blessing. Not mom's cat btw, he is twice her size but also orange. I forgot the story of the 2nd patriarch, but every football coach here is different, some are what ppl call "dictators" demanding a fixed way of living, behaving, others are more like Father figures just observing their failures and eventually blooming offering guidance where needed. I'd give my life to the dharma, but I wouldn't know where to start, the dharma, like love, has "no life" nor fixation. My Cross-Country track coach in high school was a tough, compassionate, small Black man with a high voice. No one could beat him in a sprint (nor a long race). I was taller than him, at age 14. I recall his encouraging shout, from the sidelines, during races (and even during practices): "Kick it IN!, kick IT IN!" My teacher Ven. Sheng Yen's calligraphy -- "Ch'an"
Thank you for the artwork, my friend! I'd be quite the impoverished puppy without 'cha, here (and my Cats would eat me for breakfast). That painting puts me in mind of Keith Haring (1958-1990), the late NYC street-artist fellow (died of AIDs complications) who posted graffiti all over New York and the Subways, and whose stuff I saw every day for years, with him making his start only in about 1981 there (he was from Pennsylvania). 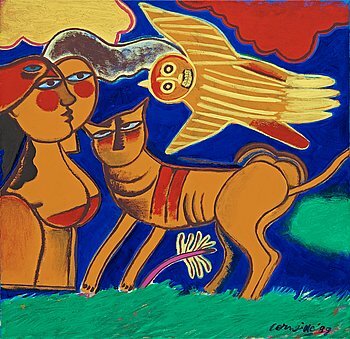 reminds me of the famous "Cobra group" Corneille is one artist from that group, not my aquired flavour in most cases, but Corneille has a lot of cats in his art, so that always peeks my interest. That's a very expressive, if somewhat horror-movie-ish skull, boda. I wonder, though, why do you, as an artist, dispense with composition, rule of thirds, etc, that photographers follow semireligiously and as a designer, you must've knowingly rejected? This object smack in the middle is of course confronting and discomforting, which may have been your intention, but a bit of space to feel and think would also be nice.. 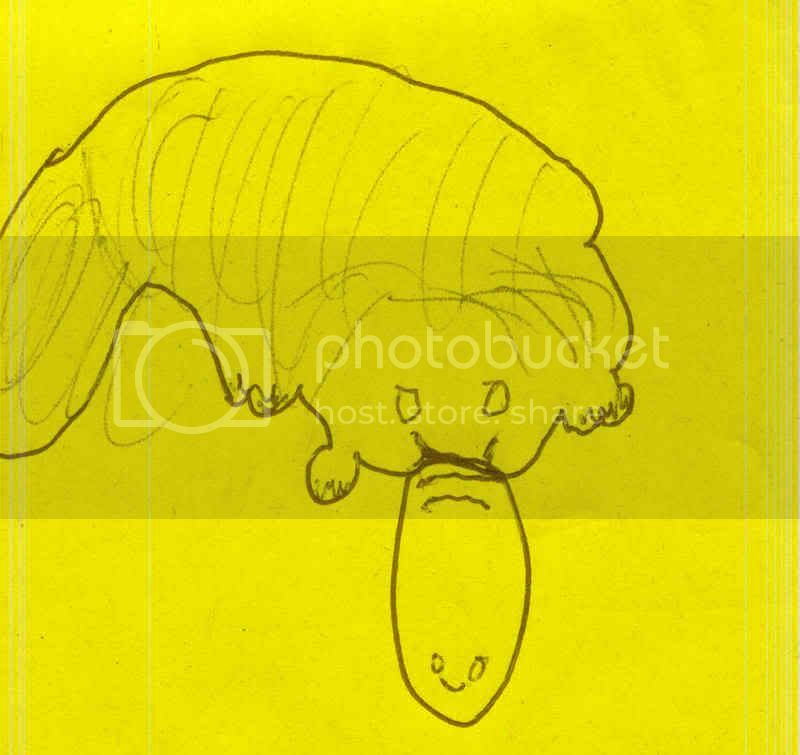 I respect your artistic eye, Dan, and don't disagree with your observations. It was a quick sketch, with some vague thoughts that somewhat directed the simple composition, and I wasn't really much more concerned with the composition than one might be with a paper napkin doodle. Do you work from "life", or?... . Puts me in mind of Shakespeare's "Hamlet". BTW, do you work in acrylics/oils, or white and black gesso? Oils here, mostly. And black and white gesso... . Canvas? Board? I like the 3-D modeling; really like it. Mostly a landscapist here; my "critics" say "bland-scapist". Well, just learning. Aren't we all, though? (rhetorical Q. ).